Poland will be the first country in the region to receive a one-off shipment of Liquid Natural Gas (LNG) from the US, said Krzysztof Szczerski, the head of the Polish president's office. Szczerski is currently in the US to meet officials and members of President Donald Trump's administration. During a press conference at the Polish embassy in Washington, Szczerski said the deal is “a great achievement, which was also supported by the President”. During his visit to Washington, Szczerski and the head of Poland's National Security Bureau (BBN), Paweł Soloch, also conducted talks in the Pentagon and met US National Security Advisor Herbert Raymond McMaster. In October, US Ambassador to Poland, Paul W. Jones, said that Poland’s new LNG terminal in the Baltic port of Świnoujście gives the country an opportunity to become a regional gas hub. “America is in the midst of an energy renaissance and we have already started exporting natural gas to Europe. We started in April. And that’s only going to grow,” Jones added. You ask and you get it. A shipment carrying Poland’s first ever liquefied natural gas (LNG) from the United States has been received at the Świnoujście LNG terminal in northwestern Poland. 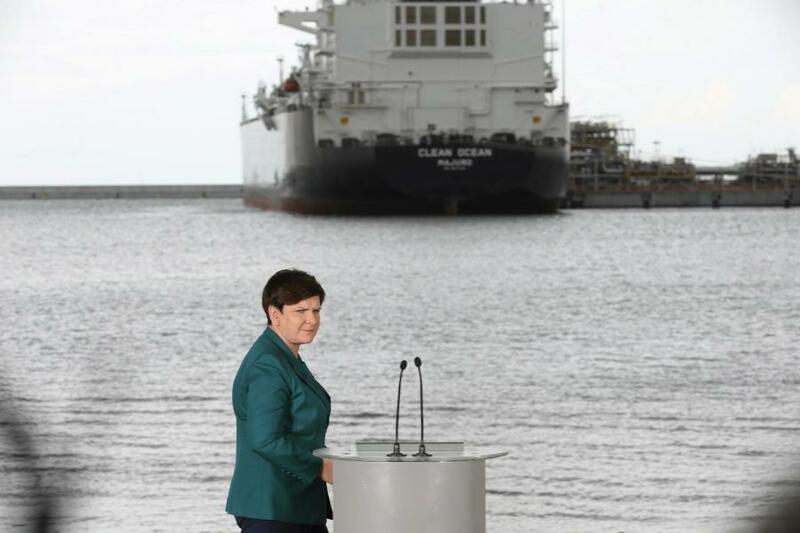 Polish Prime Minister Beata Szydło accepts an LNG delivery from the US. Photo: Twitter.com/pisorgpl.Polish Prime Minister Beata Szydło accepts an LNG delivery from the US. Photo: Twitter.com/pisorgpl. Polish Prime Minister Beata Szydło and representatives from Polish and US energy companies PGNiG and Cheniere Energy attended the "historic" gas delivery. Chief Economist at BPS TFI, Krzysztof Wołowicz, said that the one-off delivery of gas from the US is Poland’s next step in increasing energy security and lowering future gas prices. He added that more diverse supplies of gas to Poland can be a bargaining tool when Poland renegotiates its deal with Russia in a few years. Wojciech Jakóbik of the biznesalert.pl website said that Poland’s gas terminal, opened in late 2015, will mean Russia will have to make an effort to remain active on the Polish gas market. Polish gas monopoly PGNiG’s deputy CEO Maciej Woźniak said changes are afoot on the energy resources market in Central and Eastern Europe. “Deliveries to our port indicate that Poland can broaden supplies to other countries in our part of the continent,” Woźniak said. “This gives us a boost on the gas distribution market”. Poland signs a long term contract for American LNG gas and Russians seem a little anxious American gas, after adding transport fees, will finally cost the same as Russian one, greatly contributing to ending the Russian monopoly. WARSAW, Poland (AP) — Poland’s main gas company says it has signed a long-term contract for the purchase of some 40 million tons of liquefied natural gas from a U.S.-based producer in the first such deal in Central and Eastern Europe. Piotr Wozniak, the president of Poland’s PGNiG, said Wednesday the deal would help cut the country’s dependence on Russian gas imports. Under the 20-year deal signed late Tuesday, Poland will import 2 million tons of liquefied natural gas annually from Louisiana-based Venture Global Calcasieu Pass and from Venture Global Plaquemines LNG. Wozniak said the price was some 20 percent lower than the costly contract with Russia’s Gazprom, which ends in 2022. The gas will be delivered to the Swinoujscie terminal, which has been adapted to take the fuel, which is transported by ship. Как выяснил “Ъ”, заявления польской PGNiG о покупке сжиженного природного газа (СПГ) в США дешевле, чем трубного у «Газпрома», не соответствуют действительности. Декларированный выигрыш в 20–30% достигается лишь сравнением цены СПГ при его отгрузке в танкер в США с конечной ценой «Газпрома» для PGNiG. В результате американский газ вряд ли заменит российский на польском рынке: при доставке СПГ в Польшу выгода PGNiG почти нулевая, то есть его эффективнее перепродать. Но если для поляков сделка выглядит, скорее, политической, американцы в ней прямо заинтересованы: их СПГ-заводы еще не построены, и такие контракты нужны, чтобы получать финансирование. Польская госкомпания PGNiG заключила обязывающее соглашение с американской Venture Global о покупке 2 млн тонн сжиженного газа в год с 2022 года, сообщили компании. Поставки должны осуществляться в равных объемах с двух будущих СПГ-заводов Venture в Мексиканском заливе — Calcasieu Pass и Plaquemines. Газ будет поставляться на условиях FOB (то есть PGNiG получит газ в танкере у завода и сможет везти его куда захочет). Цена поставок традиционно для американского СПГ привязана к стоимости газа в США (индексу газовой биржи Henry Hub).